Cranbrook, BC (March 25, 2019) – Mackay Contracting was the successful bidder for two key projects in the City’s 2019 Capital Roads program. The 13th Avenue Road and Watermain Reconstruction from 4th Street South to 6th Street South is expected to begin in April. This project will provide a much-needed new road surface and sidewalks as well as upgraded water services for each property. 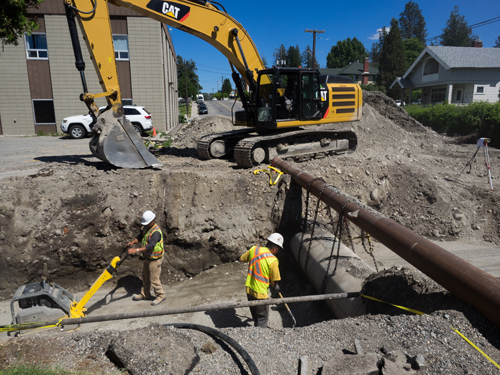 The second contract is for a major Storm Sewer Trunk Main upgrade at Kootenay Street and 4th Street North. This project will greatly improve function and capacity of this section of pipeline which is intended to mitigate backup and localized flooding events that have occurred in the past. The City expects the project to take place in July and August to coincide with the fisheries window, given the project deals with infrastructure carrying creek flows. Moving forward the City of Cranbrook intends to tender at least 3 more Capital Construction contracts that will encompass $7 million budgeted for investment into roads, sidewalks, water, sanitary and storm sewer upgrades and improvements in 2019. Another invitation to tender is out now for the road and watermain reconstruction for 8th Avenue South between 2nd Street South and 3rd Street South. The major infrastructure investments that the City has been making over the past 4 years are starting to make a real impact in service delivery and operational efficiencies. While there is a lot more work to still be done, Public Works has started to notice a reduction in major water and road repairs as the overall condition of the infrastructure improves. Since 2014 the City has provided nearly 175 new water services to residential, commercial and industrial properties in the City. They have also replaced over 3 kilometers of older leaking water mains, which in addition to reducing leaks has also vastly improved fire flow and overall resiliency of the water distribution network. * Crews with Mackay Contracting working on the reconstruction project on 2nd Street South in 2017. Photo courtesy Brian Clarkson.